After replacing Brian Williams, Lester Holt gives NBC it’s best Nightly News ratings in 10 years! JUST CURIOUS, IS IT POSSIBLE TO PULL THE PLUG ON AN ENTIRE NETWORK? As reported at The Politico, LSNBC, BSNBC, MSNBC is pulling the plug on three shows, “The Cycle,” “Now with Alex Wagner” and “The Ed Show.” But is anyone going to miss them, no one watched the garbage in the first place. MSNBC President Phil Griffin says the moves was made to change the uber-liberal cable channel as a straight-forward news and politics channel, at least in daytime. Now that’s funny, reporting straight forward, no liberal spin news. Who are they going to replace these failed shows with Bill O’Reilly? Coming in September 2015, MSNBC will add a 5 PM program hosted by “Meet The Press” moderator Chuck Todd, while Brian Williams, the former “Nightly News” anchor, will serve as the network’s breaking news and special reports anchor. Oh yeah, that will change the liberal slanted, moonbat network programming, adding lying Brian Williams to the mix. PLEASE!!! This move by MSNBC asks the age old question, If three TV shows are canceled that now one watched, did they ever exist in the first place? As the Politicus USA opines, Ed Schultz won’t be the last liberal to be let go, it has been reported for months that Al Sharpton, Lawrence O’Donnell, and Chris Hayes are also on the way out. One can dare to dream. As stated earlier, they could all be shown the door and no one would notice. There are private website that get more traffic than MSNBC. 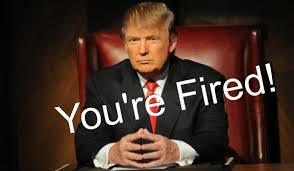 NBC TO DONALD TRUMP, YOU’RE FIRED … WELCOME TO LIBERAL INTOLERANCE AND THE MSM DOUBLE STANDARD. Look what happens when you dare take a position that goes against the liberal MSM. NBC has cut ties with Donald Trump following the comments the Donald made over a week ago when he announced his candidacy for the president of the United States. NBC stated that the network will no longer air the annual Miss USA and Miss Universe pageants that were part of a joint venture with Trump. NBC stated in a press release that, “At NBC, respect and dignity for all people are cornerstones of our values. Due to the recent derogatory statements by Donald Trump regarding immigrants, NBCUniversal is ending its business relationship with Mr. Trump.” Hmm, really? NBC has respect and dignity for all people, who knew? Unless you are a Conservative, member of the Tea Party, or anyone who dare disagree with the liberal agenda. The network will no longer air the annual Miss USA and Miss Universe pageants that were part of a joint venture with Trump, the statement added. Its relationship with “Celebrity Apprentice” will continue, as Trump ceased his involvement with the reality show during his presidential bid. 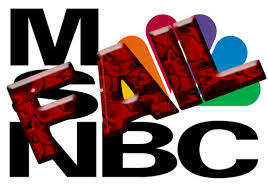 What about NBC’s values regarding telling the truth? I guess that is not high on their list or a cornerstone of their values. 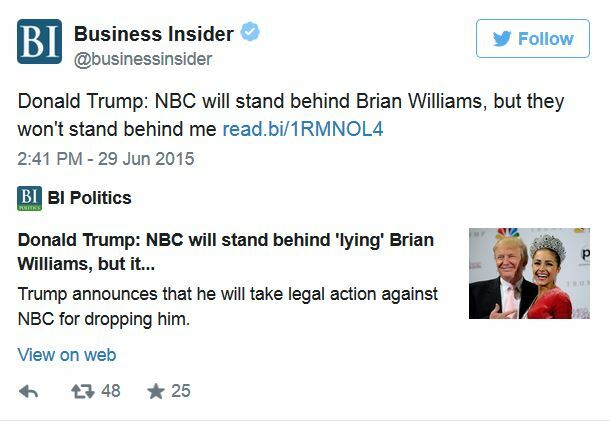 Isn’t it quite telling about NBC that they would fire Donald Trump for speaking his opinion, yet NBC kept news anchor, “lying” Brian William after it had been documented that he had lied too many times to keep track while reporting the news. But that is OK and keeping in line with NBC values. Because that showed dignity and respect. This is the same network that also employees Al Sharpton, who has made fabricated comments as well. The following comes as a shock to no one, Brian Williams is out and will not return to his position as the anchor of its “Nightly News” show. We figured the end was near as even NBC could not put him back as their Nightly News anchor with zero credibility. Williams is expected to move to a new role at NBC News, primarily at the failed cable news network MSNBC, and his career will eventually crumble. MSNBC is the perfect location for Williams seeing that the cable network doesn’t care whether the truth is told there or not. My how the might have fallen, from NBC News anchor to a cable network where more people watch infomercials at 3 AM for Snuggies. NBC is planning to announce on Thursday that Brian Williams will not return to his position as the anchor of its “Nightly News” show, four months after the network suspended him for exaggerating his experiences during a helicopter attack in Iraq, according to two people briefed on the decision. 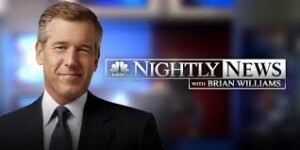 Mr. Williams is expected to move to a new role at NBC News, primarily at the cable news network MSNBC, which would probably be in a breaking-news capacity at the beginning, according to one of the people. Lester Holt, who has been filling in for Mr. Williams as anchor, will permanently assume the position as anchor of NBC’s evening newscast, one person said. Mr. Holt was previously the anchor of NBC’s weekend evening news broadcasts. Mr. Williams, 56, was riding high as the No. 1 nightly news anchor, drawing close to 10 million viewers a night. His popularity extended beyond the anchor’s chair; his quick wit and engaging manner made him a coveted speaker at dinners and panels and a frequent celebrity guest on entertainment shows. But on his newscast on Feb. 4, Mr. Williams admitted that he had embellished his account of being on a helicopter that was hit by enemy fire in 2003 and apologized to viewers. The response put him and NBC on the defensive; military veterans took him to task, and media commentators and viewers claimed he had lost the trust so critical to a network news anchor.